Multi-K™, Haifa’s flagship potassium nitrate brand, is the basis of a whole line of plain and enriched potassium nitrate products, designed for optimal plant nutrition. Potassium nitrate is a high quality source of both potassium and nitrogen, two essential macronutrients (primary nutrients) for plants. Since a healthy growth requires large amounts of nitrogen and potassium, these elements have to be applied to the soil regulary. That's where Haifa Multi-K™ potassium nitrate based fertilizers enter the picture. The nitrate facilitates uptake and improves potassium absorption by the plant. 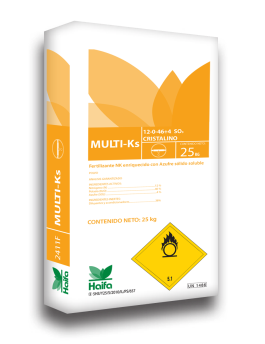 Efficient N source: All the nitrogen in Multi-K™ is the form of Nitrate (NO3-). Consists of 100% plant macronutrients. 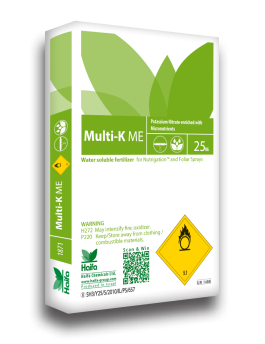 The presence of nitrate in Multi-K™ enables the plant to minimize its uptake of chloride, whenever this damaging anion is present in the soil solution or in the irrigation water. This makes Multi-K™ a necessity for chloride-sensitive crops.